Facts and information about the History and Culture of Native Americans including the subject of the Horse War Paint. Many Pictures of Native Americans on this website depict Indians with full War Paint in different shapes, colors, symbols and designs. Native American Indians even painted their horses and ponies decorating them with with war symbols or symbols of power before they went into battle - Horse War Paint. 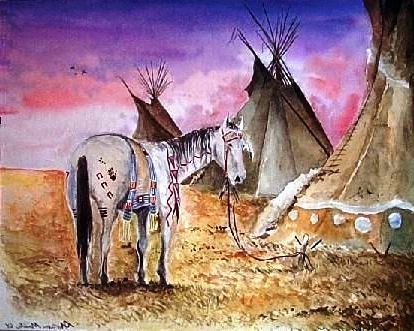 Many of the pictures and images of Native Americans depict the Indians in full War Paint but many also painted their horses with powerful symbols. An Indian horse was often painted in preparation for battle. Specific symbols were used, some of which can be seen on the above painting. The designs and symbols painted on horses were believed to hold magical powers for protection and to indicate previous victories in battle. Horse War Paint. Discover the vast selection of pictures which relate to the History and Culture of Native Americans. The pictures show the clothing, War Paint, weapons and decorations of various Native Indian tribes, including War Paint, that can be used as a really useful educational history resource for kids and children of all ages. We have included pictures and videos to accompany the main topic of this section - Horse War Paint. The videos enable fast access to the images, paintings and pictures together with information and many historical facts. All of the articles and pages can be accessed via the Native Indian Tribes Index - a great educational resource for kids.